A "greenhouse gas" traps heat in the atmosphere by absorbing radiated heat, in the form of infrared. Any gas which contributes to the greenhouse effect is called a greenhouse gas, although those produced by human activity have gotten more attention in the past few decades. The most abundant greenhouse gas is water vapor; see cloud cover. Also important are carbon dioxide, methane, nitrous oxide, and ozone. The nature of a greenhouse gas is to pass visible light, i.e., incoming energy from the sun, but to be opaque to the infrared, i.e., heat energy being re-radiated outward from the earth's surface. Greenhouse gases, by definition, are good absorbers at these wavelengths. This functions not at all like the glass on a man-made greenhouse, and serves to trap warmth at the surface and in the lower atmosphere. Some extent of greenhouse gases are necessary to maintain life at a livable temperature on Earth. These greenhouse gas molecules (principally water vapor, carbon dioxide, and methane) absorb and re-emit long-wave infrared rays emitted from the earth's surface into the atmosphere (see radiational cooling). A diagram illustrating the so-called "greenhouse effect." Sunlight falling on the surface of a planet is primarily in the visible part of the spectrum. The surface absorbs some of the incident sunlight, and some is reflected, depending on the reflectivity of the surface (see albedo). The reflected light mostly passes through the atmosphere back to space. The absorbed light warms the surface. Anything with a temperature radiates according to Planck's law, and the Earth is no exception. Due to its relatively low temperature, the emission from the ground is in the infrared (IR) part of the electromagnetic spectrum, emitted from the Earth's surface. The gas absorbs the IR radiation, and emits IR radiation, both up and down. Because these gases are above the surface, they are at a lower temperature than the surface, so they emit at a different frequency. The net effect is that energy is retained by the Earth system, warming it. This is the natural greenhouse effect, which allows the Earth to be habitable. When the atmospheric composition is changed by human activity resulting in increases in greenhouse gases, the warming associated with this theory is called the anthropogenic greenhouse effect. However, this figure has been disputed. The textbook Chemistry of Atmospheres puts the contribution of water vapor and clouds at less than 88 percent of the greenhouse effect, while carbon dioxide is at least 12 percent. This insulating effect has been compared to a blanket or to the glass walls and roof of a greenhouse, but the process is not the same. The following is a breakdown of the sources for these greenhouse gasses. 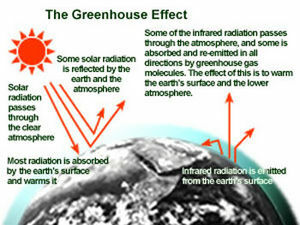 The greenhouse effect refers to the retention of heat by a planet's atmosphere. Although "greenhouse" is a handy analogy to a botanical greenhouse, which insulates an indoor space by regulating convection, the atmosphere retains heat in a different way. It happens because gas molecules absorb some of the heat radiating from the ground (see infrared radiation), so that it all doesn't escape into outer space. It was discovered in 1824 by Joseph Fourier. The effect has been compared to that of the glass roof and walls of a greenhouse, although the process is different. A gardener's greenhouse simply traps warm air inside the building. A runaway greenhouse effect has been claimed by some climate scientists, many of whom are involved in Climategate, and have argued that slight increases in trace gases in the Earth's atmosphere would lead to higher air temperatures. These higher temperatures would in turn cause "greenhouse gases" such as carbon dioxide to have higher concentrations, which in turn would accelerate the warming trend. Alarming increases of 3 to 15 degrees Fahrenheit have been predicted, as modeled in Al Gore's hockey stick graph. Outside of the political sphere, few academics give any credence to this theory, and many scientists have been critical of the hockey stick reconstruction. Some scientists have noted a natural climate change on other planets; others have pointed to Venus as an example of a planet where a runaway greenhouse effect has already occurred. However, Venus has many differences with Earth, including a lack of plate tectonics which make the comparison faulty. This page was last modified on 14 January 2019, at 04:29. This page has been accessed 29,417 times.